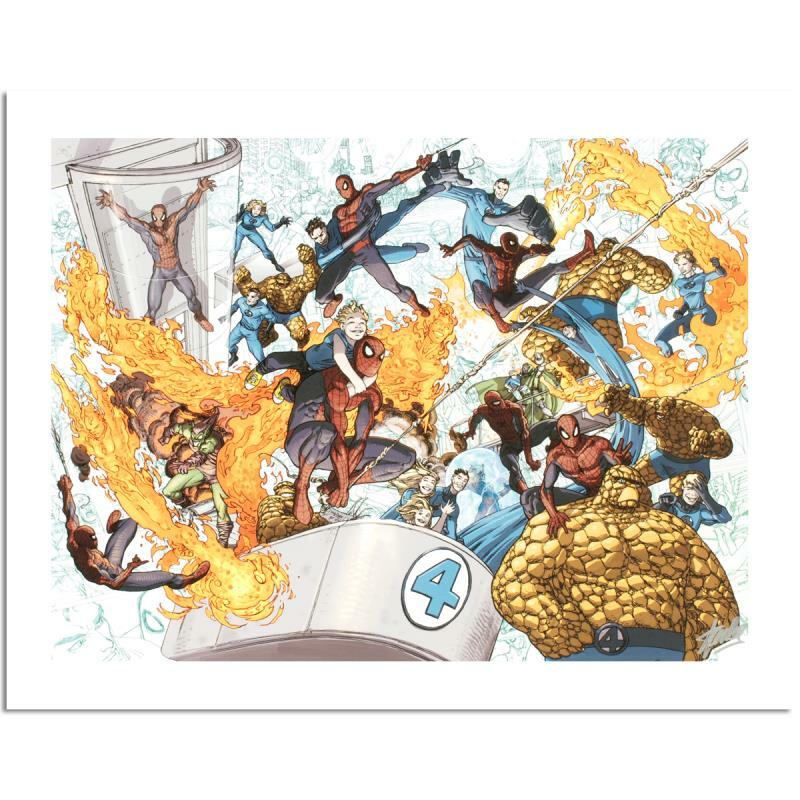 "Spider-Man/Fantastic Four #4" Limited Edition Giclee on Canvas (36" x 29.5") by Mario Alberti and Marvel Comics. Numbered Out of Only 4 Pieces and Hand Signed by Stan Lee (1922-2018). Includes Certificate of Authenticity. Custom Framed and Ready to Hang. 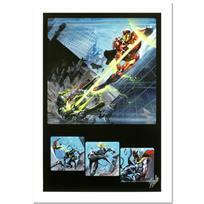 A piece of comic book history, this limited edition, from original art by Mario Alberti, depicts an action-packed scene with Spider-Man and the Fantastic Four. Italian artist Mario Alberti is particularly known for his covered work for both DC and Marvel comics. "Iron Age: Alpha #1" is a limited edition giclee on canvas by Mario Alberti presented by Marvel Comics, hand signed by the Great Stan Lee (1922-2018) and numbered out of only 4! This piece has been custom framed using acid free materials and is ready to hang. Includes Certificate of Authenticity! Measure approx. 36" x 29.5" (framed); 28.5" x 21.5" (image). Born in 1922 in New York City to humble beginnings, Stan Lee is now perhaps the most well-known name in the world of comics and superheroes. His career in comics began when he was 16 by becoming an assistant at Timely Comics, which would soon evolve into Marvel Comics. Lee quickly worked his way up the corporate ladder to become writer and eventually editor-in-chief. In the late 1950s, Lee was given the task to come up with a superhero team to rival the popular Justice League of America. Always preferring stories of heroes with flawed pasts and obvious humanity, Lee, with the help of artist Jack Kirby, created the Fantastic Four, which proved to be an instant success. Stan Lee is also credited with helping create Spider-Man, the X-Men, the Avengers, Iron Man, the Hulk, Thor, Daredevil, Doctor Strange, and many others. Lee’s contribution to Marvel helped expand Marvel Comics into the entertainment giant that it is today. Stan Lee passed away November 12, 2018. 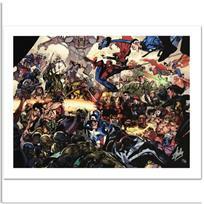 "House of M #6" Limited Edition Giclee on Canvas (36" x 29") by Oliver Coipel and Marvel Comics. Numbered Out of Only 4 Pieces and Hand Signed by Stan Lee (1922-2018). Includes Certificate of Authenticity. Custom Framed and Ready to Hang. 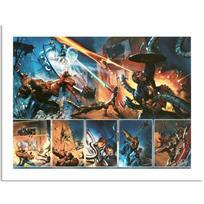 "Secret Invasion #6" Limited Edition Giclee on Canvas by Leinil Francis Yu and Marvel Comics. Numbered and Hand Signed by Stan Lee (1922-2018). Includes Certificate of Authenticity. 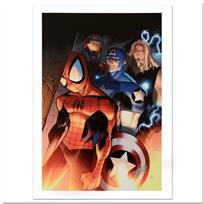 "Ultimate Spider-Man #151" Limited Edition Giclee on Canvas by David Lafuente and Marvel Comics. Numbered and Hand Signed by Stan Lee (1922-2018). Includes Certificate of Authenticity. 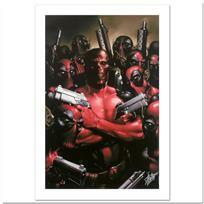 "Deadpool #2" Limited Edition Giclee on Canvas by Clayton Crain and Marvel Comics. Numbered and Hand Signed by Stan Lee (1922-2018). Includes Certificate of Authenticity. "Wolverine Avengers Origins: Thor #1 & The X-Men #2" Extremely Limited Edition Giclee on Canvas (29" x 40") by Kaare Andrews and Marvel Comics. Numbered Out of Only 4 Pieces and Hand Signed by Stan Lee (1922-2018). Includes Certificate of Authenticity. Custom Framed and Ready to Hang. 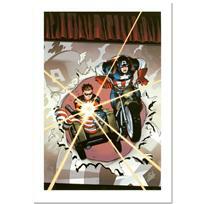 "Captain America and Bucky #621" Extremely Limited Edition Giclee (28" x 39") on Canvas by Ed McGuinness and Marvel Comics. Numbered Out of Only 4 Pieces and Hand Signed by Stan Lee (1922-2018). Includes Certificate of Authenticity. Custom Framed and Ready to Hang. 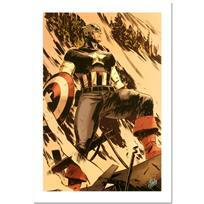 "Operation Zero-Point #1" Limited Edition Giclee on Canvas (30" x 41") by Mitchell Breitweiser and Marvel Comics. Numbered Out of Only 4 Pieces and Hand Signed by Stan Lee (1922-2018). Includes Certificate of Authenticity. Custom Framed and Ready to Hang. "Secret War #4" Limited Edition Giclee on Canvas (36" x 29") by Gabriele Dell'Otto and Marvel Comics. Numbered Out of Only 4 Pieces and Hand Signed by Stan Lee (1922-2018). Includes Certificate of Authenticity. Custom Framed and Ready to Hang. 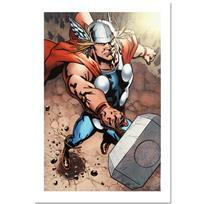 "Avengers #12" Extremely Limited Edition Giclee on Canvas (35" x 28") by Matthew Clark and Marvel Comics. Numbered Out of Only 4 Pieces and Hand Signed by Stan Lee (1922-2018). Includes Certificate of Authenticity. Custom Framed and Ready to Hang. "Secret War #1" Extremely Limited Edition Giclee on Canvas (28" x 39") by Gabriele Dell'Otto and Marvel Comics. Numbered Out of Only 4 Pieces and Hand Signed by Stan Lee (1922-2018). Includes Certificate of Authenticity. Custom Framed and Ready to Hang.